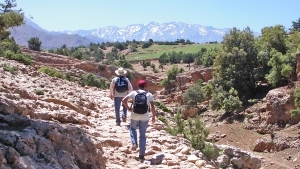 These full day walks start either from the Kasbah itself or use car transport to reach a very special area higher up in the mountains. Mount Khelout lies to the south-west of the Kasbah. We cut across the valley and follow a path to the first plateau (1,200m), then follow a steep path that takes us to the summit of Khelout (1,545m). 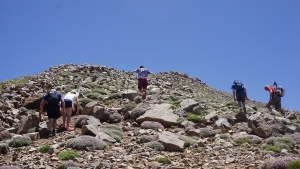 After admiring the views of Mount Toubkal, Asni and the Imlil valley, proceed along the ridge and descend by a path that takes us further south and down to a col. There is then a choice of routes for the return leg. This is the mountain ridge that you can see to the south of Kasbah Angour. From the end of the valley, there is a steep path to reach Foudrar. We then traverse the ridge reaching 1,654m where there are wonderful views of the summits of the mountains and the Haouz Plain. 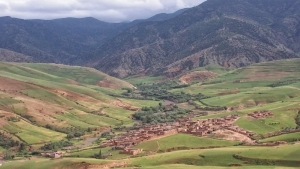 Return to the Kasbah via Ijikene village with its traditional Berber houses constructed from compacted earth. Mount Oukaimeden (3,262m) is one of the mountain peaks to the south of Kasbah Angour. A car is used to travel between Kasbah Angour (1,000 m) and the Oukaimeden ski village (2,600m). This is a very enjoyable journey in itself as we see part of the Ourika valley and Berber mountain villages as the road climbs up to Oukaimeden. Walking starts at the village from where we climb at high altitude to reach the summit of the mountain and our reward of spectacular 360° views. Travel by car to Tansghart village (1,300m) south of Asni to start the walk. Follow the beautiful Imenane river until we reach the Assif Tissili valley. 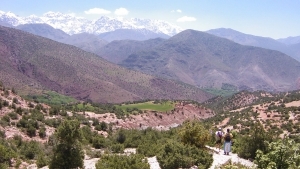 Now take the path via Ouskir village to proceed up across Plateau Tihallatine with spectacular views to Mount Toubkal. 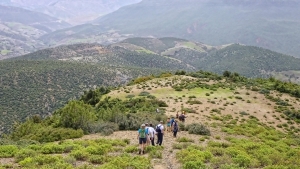 We then join a delightful path down through the lightly forested mountainside to Douar Ouraken and back to Kasbah Angour. In these full day walks, we start either from the Kasbah itself or use car transport to reach a very special area higher up in the mountains. Mount Khelout lies to the south-west of the Kasbah. We cut across the valley and follow a path to the first plateau (1,200m). We then follow a steep path that takes us to the summit of Khelout (1,545m). 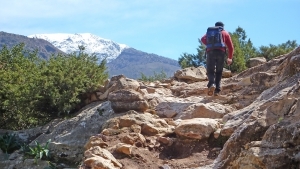 After having admired the views of Mount Toubkal, Asni and the Imlil valley, we proceed along the ridge and then descend by a path that takes us further south and down to a col. There is then a choice of routes for the return leg. This is the mountain ridge that you can see to the south of Kasbah Angour. From the end of the valley, there is a steep path that we use to reach Foudrar. We then travverse the ridge reaching 1,654m. There are wonderful views of the summits of the mountains and the Haouz Plain. We return to the Kasbah via Ijikene village, where the traditional Berber houses are constructed from compacted earth..
Mount Oukaimeden (3,262m) is one of the mountain peaks to the south of Kasbah Angour. We benefit by using a car to travel between Kasbah Angour (1,000 m) and the Oukaimeden ski village (2,600m). This is a very enjoyable journey in itself as we see part of the Ourika valley and Berber mountain villages as the road climbs up to Oukaimeden. The day’s walking starts at the village from where we climb at the high altitude to reach the summit of the mountain. We are rewarded with spectacular 360° views. We travel by car to Tansghart village (1,300m) to the south of Asni. We follow the beautiful Imenane river until we reach the Assif Tissili valley. We then take the path via Ouskir village and proceed up across Plateau Tihallatine. 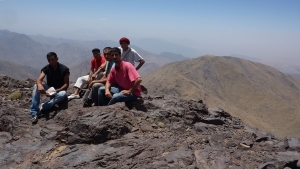 There are spectacular views to Mount Toubkal. 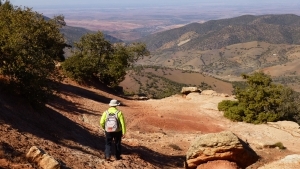 We then join a delightful path that takes us down through the lightly forested mountainside to Douar Ouraken and back to Kasbah Angour.